The parents of my wife’s 2nd great-grandfather, Samuel Aquilla Long, are unknown. Some researchers indicate that his father’s name is John. However, I can find no source for that suggestion. FamilySearch and Ancestry have no other suggestions nor hints about his family. Without any clues to his parents, I decided to do a quick locational surname study and see what I can find. Samuel was born about 1817 in Martin County, North Carolina. 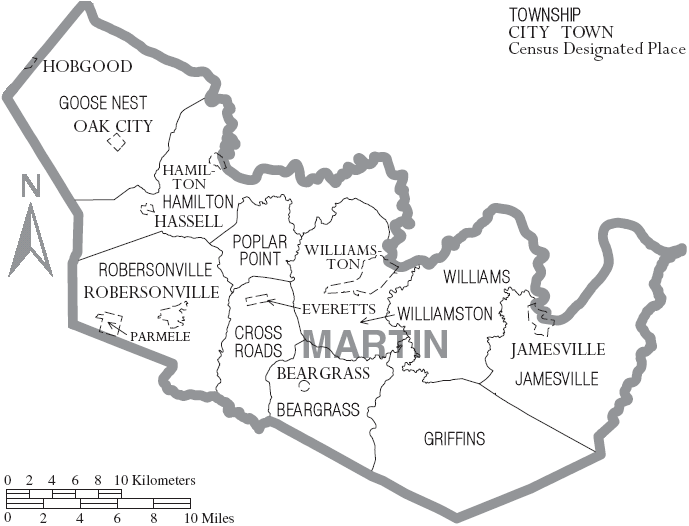 He married Martha Ann Bryan in 1844 and appeared in the 1850 Census living in Martin County. Because of that, I suspect he was enumerated in the earlier censuses 1820-1840, which only shows the name of the head of the household. The 1850 Census, which provides the names of individuals in a household, although not relationships, is a good place to begin. The Sam C A Long (Samuel A. Long) household appears to be a traditional family, parents and four children. Samuel is my wife’s 2nd Great-Grandfather’s household in 1850. I confirmed all entries were in my database already. Approximate Birth Year, Birthplace, and Residence on 1 June 1850. Next door to Samuel Long is William Long. Samuel is dwelling 638 and Family 503. William is dwelling 639 and family 504. William is 28 years old and owns the property valued at $1300. By the census, within the same family unit are three additional dwellings with the following occupants. 661 George Rawls (Age 33) apparently with wife Gatsy, and 4 children. 662 Elizabeth Johnson (age 60) with apparently three adult children. Certainly, it is likely that William Long is related to Samuel Long. With Samuel being 33 and William being 28, I guess that they are probably brothers or 1st cousins. The people in the three additional dwellings are also possibly related. But for now, I’ll enter William Long as unrelated into my system but leave a note about the other individuals in his file. Finally, there is the household of A. S. Mooring. He is the 33-year-old Sherriff. His household, #29, consists of 14 people. Six of the people are Moorings and appear to be the Sheriff, his wife, and four children. Besides them, there are three females, Mary A C Long, A. E. Long, and Cindarilla Whitaker. Finally, there are five males in their 20s and 30s. Mary A. C. Long is 30 and A E Long is 12. Next, I’ll look at the 1840 Census and see if I can place some of these individuals into households…. [i] “United States Census, 1850,” database with images, FamilySearch (https://www.familysearch.org/ark:/61903/1:1:M4B8-HFS – 12 April 2016), Household of Joshua Long, Martin county, Martin, North Carolina, United States; citing family 624, NARA microfilm publication M432 (Washington, D.C.: National Archives and Records Administration, n.d.). [ii] “United States Census, 1850,” database with images, FamilySearch (https://familysearch.org/ark:/61903/1:1:M4B8-5QZ – 12 April 2016), May Long in household of Sam C A Long, Martin county, Martin, North Carolina, United States; citing family 503, NARA microfilm publication M432 (Washington, D.C.: National Archives and Records Administration, n.d.). [iv] “United States Census, 1850,” database with images, FamilySearch (https://familysearch.org/ark:/61903/1:1:M4B8-5QG 12 April 2016), William Long, Martin county, Martin, North Carolina, United States; citing family 504, NARA microfilm publication M432 (Washington, D.C.: National Archives and Records Administration, n.d.). [v] “United States Census, 1850,” database with images, FamilySearch (https://www.familysearch.org/ark:/61903/1:1:M4B8-MT212 April 2016), Mary A C Long in household of A S Mooring, Martin county, Martin, North Carolina, United States; citing family 29, NARA microfilm publication M432 (Washington, D.C.: National Archives and Records Administration, n.d.).